In some countries, oral fluid became a widely used sample to detect of PRRS virus genome by RT-PCR and antibodies by ELISA. There are commercial kits and in-house assays for both techniques. Nonetheless, it is important to remark that due to physical characteristics of oral fluid the RT-PCR and the ELISA kits used for serum analysis cannot be directly applied to this type of sample; the assays must be adapted. Natural behaviour of pigs facilitate sampling. Not invasive. Collection without restraining animals result in a vast stress reduction. Possibility of testing a large number of individuals in aggregate samples (useful for monitoring purposes). Regarding RT-PCR, serum and oral fluid could be considered equivalent during the viraemia period. Serum contains equal or higher concentration of virus than oral fluid for the first two weeks, while it is higher in oral fluid from three-four weeks onwards. 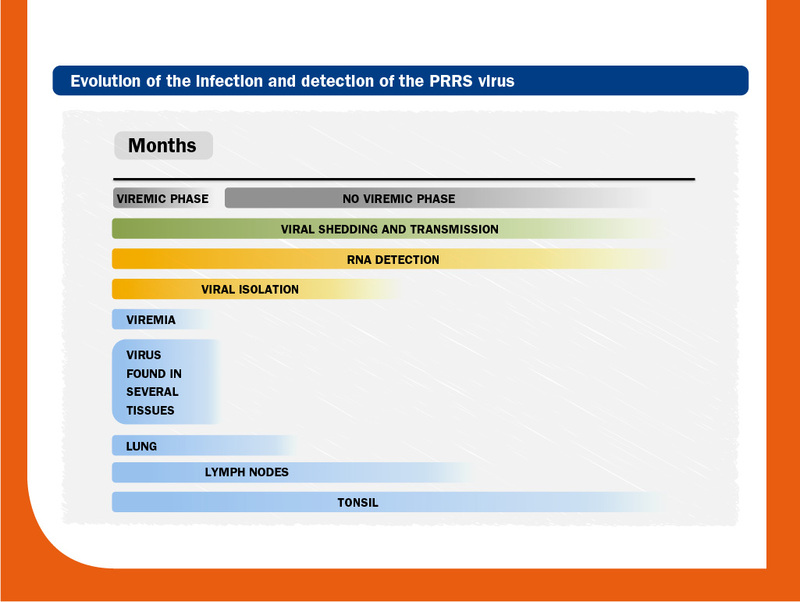 Since excretion period of PRRS virus is usually longer than viraemia, positive results in oral fluid can be obtained during days or even weeks after the end of viraemia. As a result, pigs could show negative RT-PCR results in serum being positive for oral fluid. During this period, the detection of the virus in oral fluid is usually intermittent. Another important point to take into consideration is that excretion period is lower and much more intermittent in vaccinated pigs. Obviously, this fact has direct implications in oral fluid diagnostics in a PRRS virus-endemic farm where animals are vaccinated. Regarding ELISAs for sera , they could be considered specific with a varying degree of sensitivity; however, in the case of oral fluids, it seems that ELISAs may have a problem of specificity, detecting 5-7% of false positives. Number of ropes (distribution, size and density of pens). Material of ropes. Untreated cotton is recommended. Sick animals interact less, or even do not interact with the rope. Age of animals. Difficulty during sampling of young animals (3-5 weeks-old). Contamination by feedstuff or feces. Storage conditions and shipment. It is important to note that RNA is easily degraded in biological fluids. Therefore, shipment and storage conditions are critical. When sampling of newborn piglets is mandatory (for example, to determine if vertical transmission exists) several problems appear: to obtain oral fluid is complicated, or even impossible, and with bleeding insufficient or bad quality (coagulation) samples are often obtained. In addition, bleeding small animals is a time-consuming task and in some cases die. An alternative to bleed newborn piglets is to collect the fresh umbilical cord. Very easy to collect. It can be carried out directly by farm workers. The umbilical cord must be clamped and cut (portions ≥ 5 cm are recommended). Sampling does not consume too much time. Sensitivity is as high as bleeding. As cross-contamination can exist, umbilical cord should be used to determine the status of the litter more than the prevalence of the individual. Often, storage conditions of samples in the field are less than optimal, especially when RNA pathogens want to be analyzed; to prevent RNA degradation samples should be refrigerated or frozen. Dried-blood filter papers are treated filters containing chemicals that lyse cells, denature proteins and protect DNA and RNA from nucleases, oxidation and UV damage. They can be used to collect, transport and storage up to 125 µL of blood, oral fluid or any other fluid of interest at ambient temperature. Thus, one of the main advantages of this method is that samples can be submitted to the lab by regular post. Samples can be storage for long periods (from months to years) since nucleic acids are immobilized and preserved in the fibers of the matrix. When sensitivity and specificity of PRRS virus real time RT-PCR performed directly in fresh samples or in samples embedded in dried-blood filter papers are compared, it seems that there are some problems detecting the virus in embedded oral fluids. Regarding embedded blood, the sensitivity could decrease due to the low amount of sample collected and in those samples with low quantity of virus. Thus, fresh samples with RT-PCR values near the cut-off (high Ct, it means low quantity of virus) could result negative when samples are transferred to the dried-blood filter paper. As a result, it seems that the method could loss sensitivity in animals not acutely infected.